I thought I'd come up with my official favorite banana bread recipe with my previous healthy banana bread, but by an accident of ingredients on hand, I have found one I like even more. 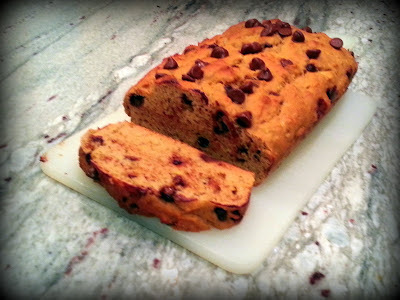 I was going for something healthier but still a little decadent, so this time it was a chocolate chip banana bread. I didn't have the applesauce I used last time on hand, so I used fat free Greek yogurt instead. Turns out this version was even more delicious! The yogurt made it really rich and moist and provides a great alternative to recipes that use tons of butter or oil. Given this recipe doesn't include oil, butter, white sugar or white flour, even with the chocolate chips, it's pretty darn healthy. Now I must admit, I ate this served warm with a little butter, so it wasn't exactly diet food, but good Lord, it was incredible! Preheat oven to 350. Spray/grease bottom of a 9x5x3 inch loaf pan and set aside (I used a baking spray with flour). Whisk together all dry ingredients except for chocolate chips in a large bowl. Smash bananas and mix with wet ingredients and chocolate chips in a separate bowl. Fold banana mix into dry ingredients until just combined. Pour batter into loaf pan. Sprinkle a few more chocolate chips on top if you like it extra chocolatey! Bake for 45-60 minutes, until a toothpick comes out clean. Check after 45 minutes to avoid over-baking. Let sit for 20 minutes and enjoy!